It’s easy for children to get separated from their families on the busy midway. In 2017 TCSO reunited 133 kids with their families. 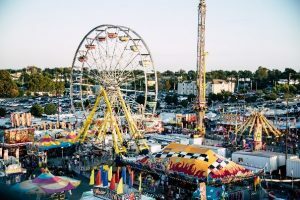 Before you head to the fair, teach your child your full cell phone number, including area code. Take a picture of each of your children with your cell phone before entering the fair. This will give you a current photo of them and what they are wearing. Tell your child that if they get lost, to look for a deputy to help them. TCSO offers free wrists bands for children. Parents write their cell phone numbers on the bands, so that if their child gets lost, deputies can quickly reunite them with their families. You can get wristbands at TCSO’s Command Post on the east end of Expo Square, as well as our on the upper level of Expo Square. If your child becomes lost, you don’t have to search for them alone. Alert a Deputy patrolling the midway or go to the “lost child” center on the west end of the Midway, near the kiddie rides. When you park, be sure your vehicle is locked and no valuables are visible through the windows. The midway can be crowded. In case of a medical or law enforcement emergency, please stand back and give first responders room to do their jobs. Under 21 O.S § 1290 D.3, concealed and non-concealed firearms are not permitted at the Tulsa State Fair.